Step 1. 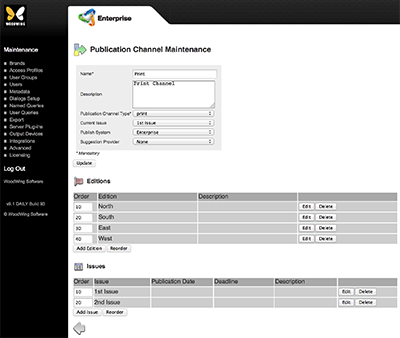 Access the Publication Channel Maintenance page for the Publication Channel for which Issues need to be set up. Step 1b. 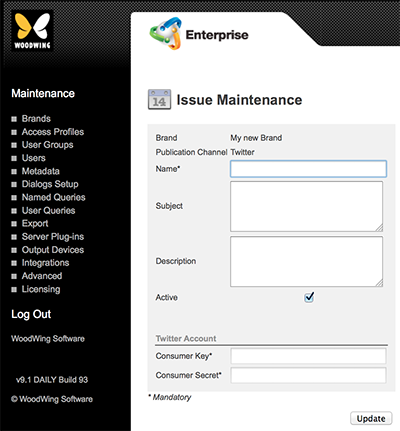 Click the name of the Brand in which an Issue needs to be created. Step 1d. 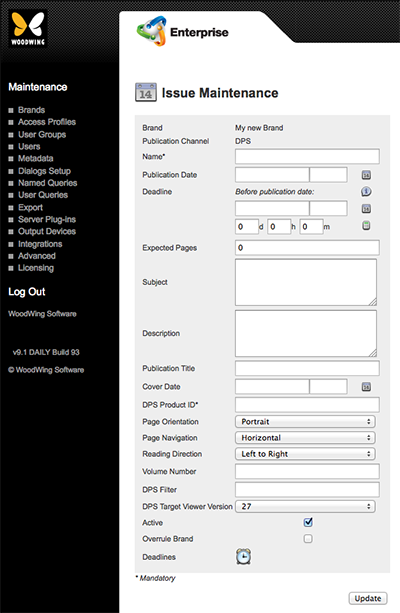 Click the name of the Publication Channel in which an Issue needs to be created. Step 2. In the Issues section, click Add Issue. 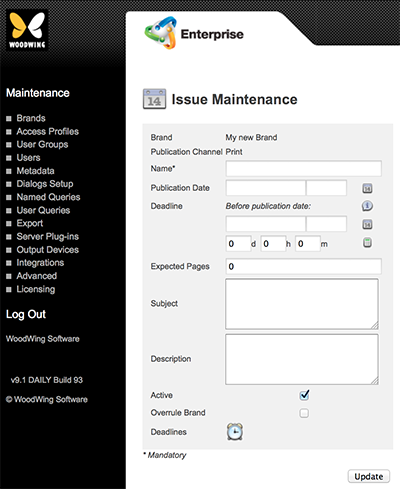 Figure: The Issue Maintenance page for a print channel. Overrule Brand. Use to determine if the new Issue should have its own Categories, Workflow, and User Authorization definitions. After selecting this option, click the Update button to display the options for setting the Categories, Workflow, and Authorizations for this Issue. Note: When used, make sure to enable Overruled Issues in Content Station. Reading Direction. Only available when Overrule Brand is active (and after clicking Update). 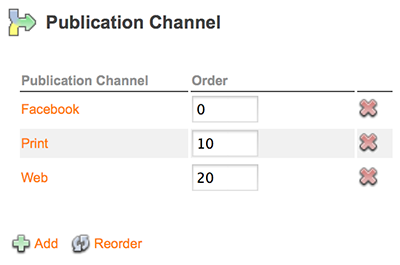 Determines whether the pages in the Issue are displayed left to right or right to left (reversed) when viewed in the Publication Overview of Content Station. Activate Relative Deadlines. 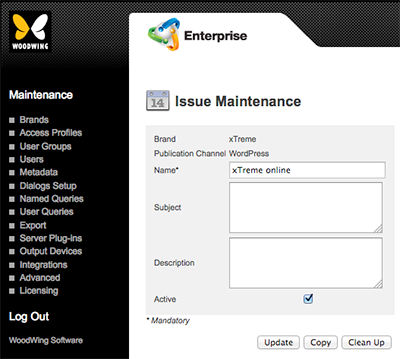 (Since Enterprise 9.2) Only available when Overrule Brand is active (and after clicking Update). Activates the functionality for assigning deadlines to Categories and Workflow Statuses. When selected, the 'Time Settings' icon appears. Time Settings. Only available when Overrule Brand is active (and after clicking Update), and (since Enterprise 9.2) after clicking 'Activate Relative Deadlines'. Displays the Relative Deadline page. Deadlines. 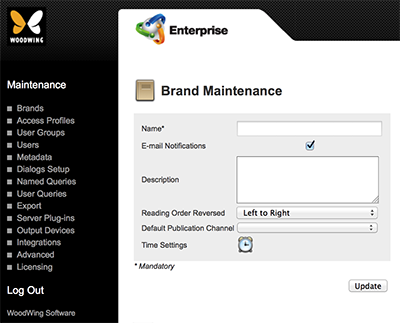 (Since Enterprise 9.2 this option only appears when 'Activate Relative Deadlines' is selected on the Brand Maintenance page.) Displays the Issue Deadlines page. Time Settings. Only available when Overrule Brand is active (and after clicking Update). Displays the Relative Deadline page. Deadlines. Displays the Issue Deadlines page. Activate Relative Deadlines. 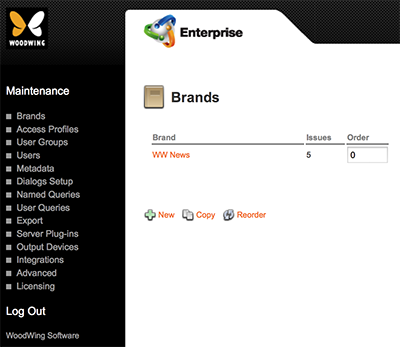 (Since Enterprise 9.2 or higher. Only appears when 'Overrule Brand' is active (and after clicking Update). Activates the functionality for assigning deadlines to Categories and Workflow Statuses. When selected, the 'Time Settings' icon appears. Time Settings. Only available when Overrule Brand is active (and after clicking Update), and (since Enterprise 9.2) after clicking 'Activate Relative Deadlines'. Displays the Relative Deadline page. Info: This feature requires Enterprise Server version 9.2 or higher. Step 3. Enter the details. 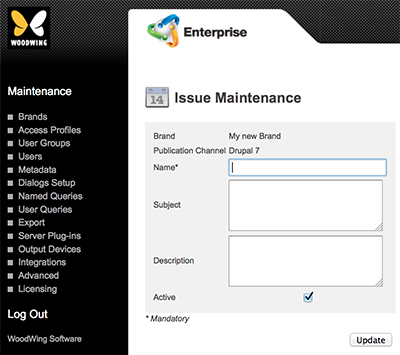 The Publication Channel Maintenance page appears with the newly created Issue added to the Issues section.